It was absolutely perfect. The weather was unbelievable. Forget spring, we went from snow right into summer. With temperatures in the low 80s all weekend, DC was amazing this weekend. On Friday, The Pilot and I got home from work at the same time and headed out to grab a quick bite to eat before I headed to a Yoga for Runners class with my friend Laura. The class was just what I needed going into the weekend and afterwards, The Pilot and I grabbed some froyo and called it a night. We slept in a little bit on Saturday and I made scrambled eggs for breakfast. 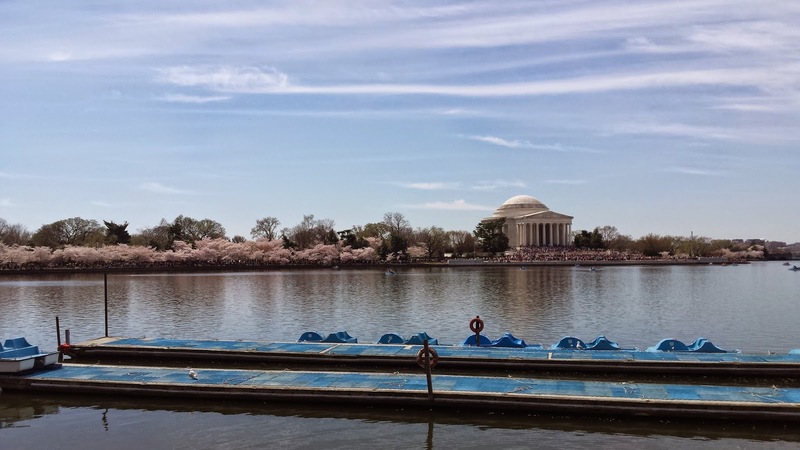 Then, we headed out to pick up some Bikeshare bikes and made our way through the masses of DC tourists to the Tidal Basin for a paddle boat ride among the cherry blossoms. 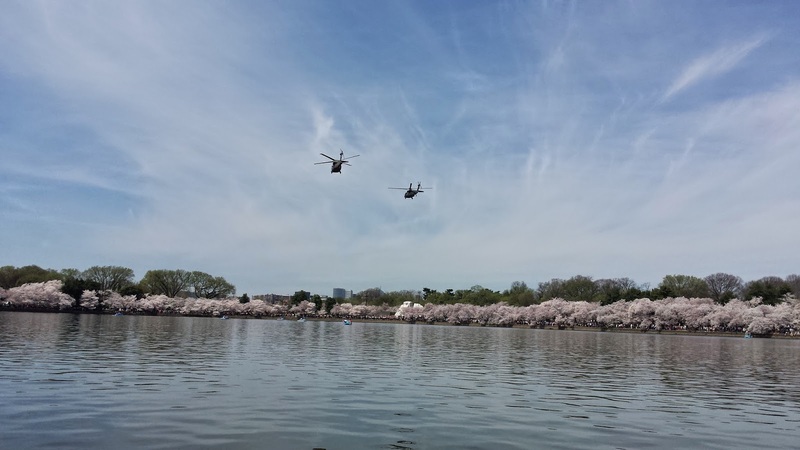 The cherry blossoms are absolutely amazing this year and I'm glad that we took the approach of seeing them from the water this year, instead of attempting to make our way through the crowds on the Tidal Basin. 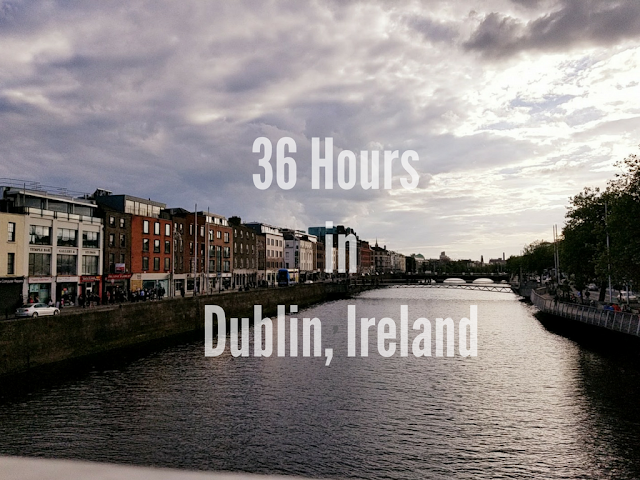 We were on the water for an hour and had so much fun! 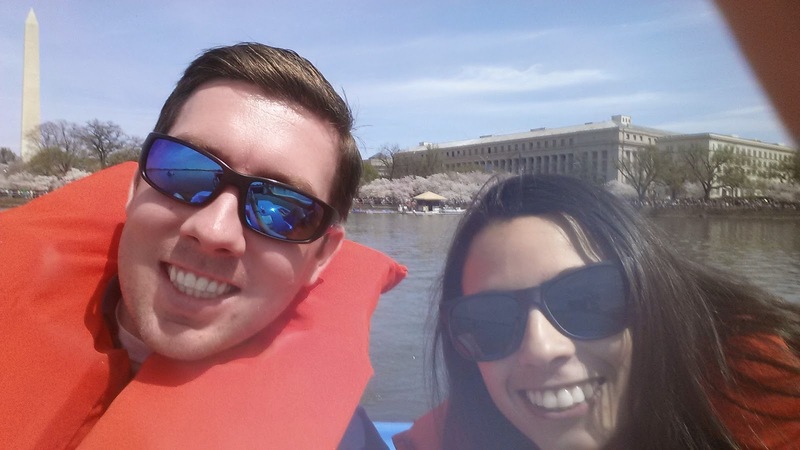 Floating on the water between the Washington Monument and the Jefferson Memorial with the cherry blossoms in peak bloom were prime cause to sit back, relax and talk about how much we absolutely love this city. After our boat ride, we headed to the Washington Monument to meet up with my cousin Jen who was in town. We spent some more time on the Mall before wandering over to Sweetgreen for lunch. 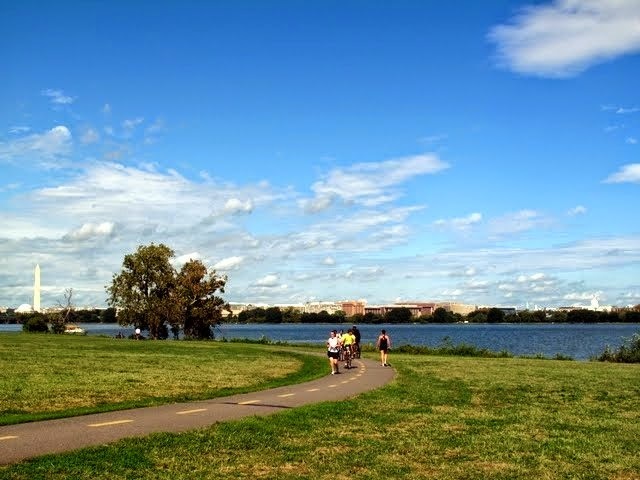 While we were there, one of my friends emailed me and asked if we wanted his tickets to that night's DC United game, so we hopped on a pair of bikes and headed over to Dupont to pick up the tickets, stopping for Shake Shack along the way. We stopped off to take Peyton out and then headed to the game. I had gone to one DC United game before we moved here (almost 4 years ago) and I think the stadium has gone way south since then. 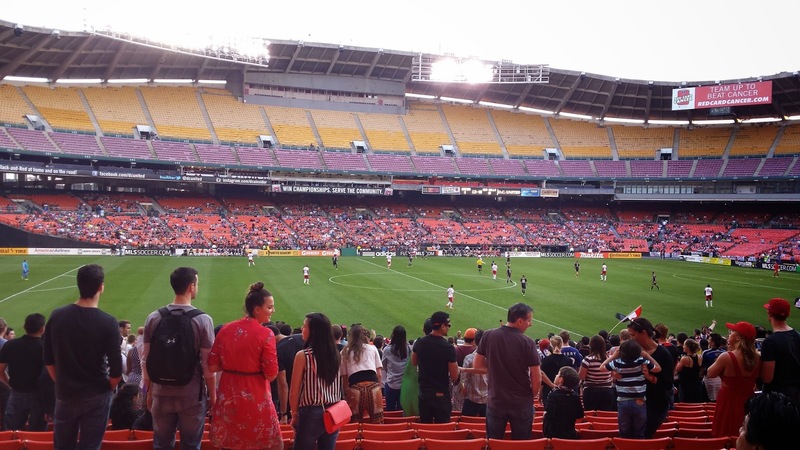 RFK Stadium desperately needs to be knocked down. Aside from the fact that the place was falling apart, they had maybe 5 concession areas open in the entire stadium. On top of that, everyone in the stadium was SMOKING! I was shocked to see that and when I checked on my phone to see if that was allowed, I saw that smoking is prohibited in the stands. The fact that that rule isn't at all enforced was crazy and it made for a less than enjoyable experience. United beat the NY Red Bulls 1-0. Post-game, we headed out to Dupont to meet up with some friends at GBD. Aside from the fact that my beer was terrible and my food never arrived, we had a good time and stayed out way too late. Sunday morning, I slept in and then dragged my feet around for ages before I finally convinced myself to get out the door for my 8 mile run. I was really nervous to get this run in. The Pilot came along with me for the first half of the run and we decided to go out 2 miles and back 2 miles so that at my furthest point in the run, I wouldn't be more than 2 miles from home in case I needed to stop. Well, I didn't. 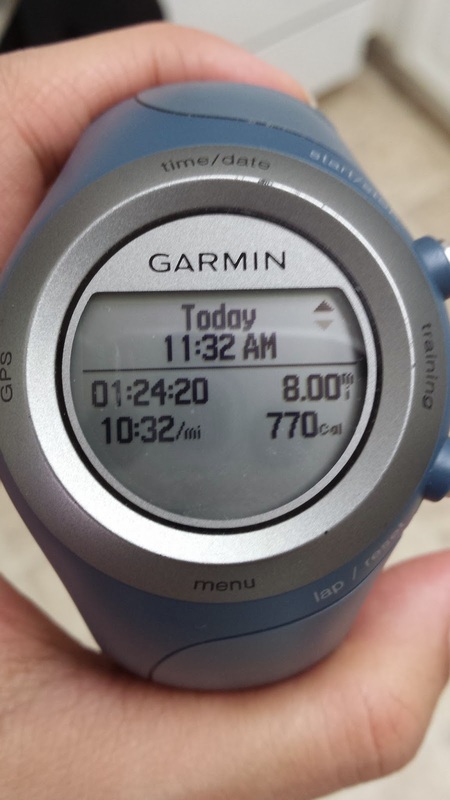 I finished the run and I felt better than I have in months. For the first time, I finally feel like I'll be ready to toe the line at Nike in 2 weeks. I came home and stretched, foam rolled and iced for what seemed like hours. We grabbed Jimmy John's for lunch (my guilty post-run pleasure), took Peyton for a super long walk, ran some errands and headed to church. We made dinner together and then relaxed on the couch, finally putting our feet up after a long, busy weekend. Have you ever been paddle boating? Ever been to DC during the cherry blossoms' peak bloom? Sounds like a truly fantastic weekend!! I'm glad you finally got to go paddle boating :) and YAY for a great run!! You are gonna do so awesome in the Nike half! Soo excited for your 8 mile run!!! Yeah!! We were thinking to go to DC to see the Cherry Blossoms but we were concerned with traffic and the mass o people. So we went to a local vendor show for baby items and grabbed some sushi. It was a relaxing and great weekend! Your food never arrived???? Awful. But everything else sounds great. I love Sweetgreens and miss it. Seeing the cherry blossoms on the water is genius.